A lot of customers come to our site with questions like “What does a broken MacBook screen look like?” and especially “How much does it cost to fix a MacBook screen?” Here’s a great example of a typical screen repair for a MacBook Air. A crack is clearly visible diagonally across the bottom right corner, with grey areas and white areas surrounding it. There are also multicolored vertical lines throughout the display area, and green inky smears or splotches around the perimeter. 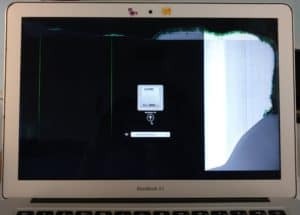 It may not initially seem like the screen is cracked, because the LCD panel is still smooth to the touch, but the internal part of the LCD can be damaged very easily from rough handling, drops, or closing the lid of the laptop on an object, such as a pair of earbuds. This LCD screen is definitely broken. Now that we’ve diagnosed the issue, the customer sends their computer in to us for repair (using plenty of bubble wrap!). We remove the damaged LCD panel and replace it with a new one, then reassemble the computer and test out the screen. On this model MacBook Air, we use a 13 inch LCD panel, and the total cost for replacement is only $329, parts and labor. Then we package the computer for shipment, and send it on its way home.